Triple Drop is pretty much skiing right down the middle of this photo. 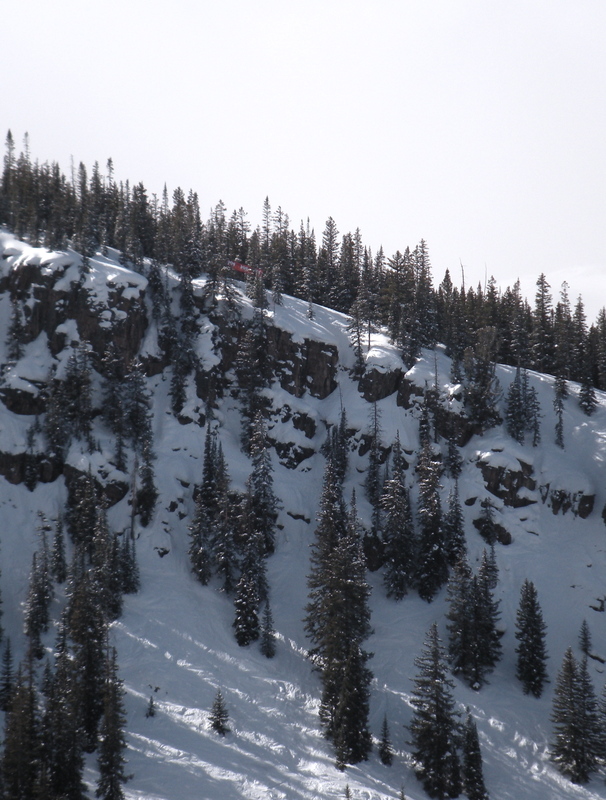 From a distance, the infamous Triple Drop on the Burnside cliffs at Snowmass is a little intimidating. I studied up on YouTube about others skiing the line, and I remember seeing people ski it watching the comp when I was growing up, so I knew it could be done. After two weather days, the competition came down to a one-run comp on Sunday. I knew I would have a chance to make the podium if I stomped the line. Triple Drop from above. Not too bad, right? 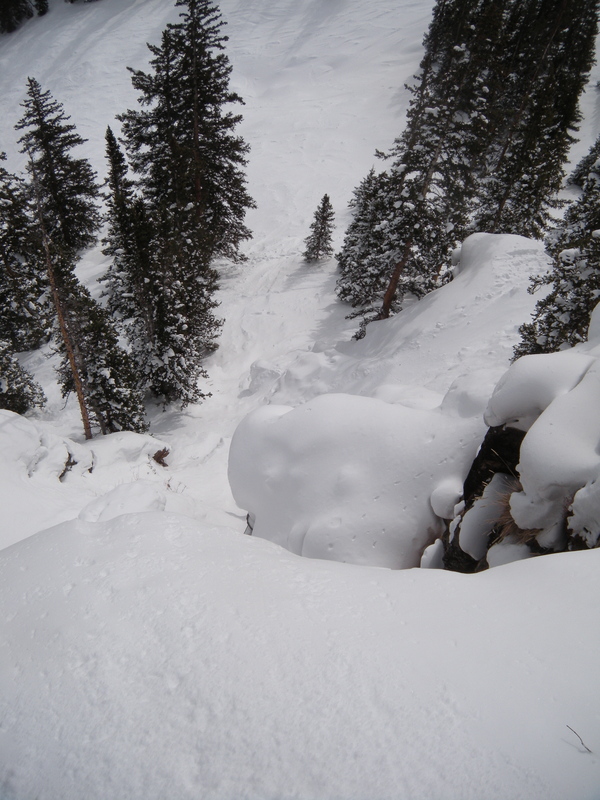 Land on the pillow directly below, then the pillow below it, then launch into the tree couloir below, and fall after straightlining to the very tip-top of the photo. You’ll do exactly what I did! I didn’t get to stand on top of the line until Saturday’s inspection, and this is what I saw. This notorious line was inspected by others, but I definitely had the lowest bib number so I knew the line was mine. My only concern was the left-sloping, uphill landing after the first drop, but since I would be first to drop it, I knew soft snow awaited below. After a second inspection Sunday morning, it was go time. I skied to the top, and dropped in quickly, knowing the drop wouldn’t get smaller anytime soon. Luckily, what these photos don’t show is that I pretty much hot-tubbed the landing of the first pillow, clogging half my goggles with snow. Then, after taking the next three drops into a really fast straightline, I did an accidental polish donut just before the finish line, which earned me a (solid?) 31st place. Certainly not the finish I was looking for, but at least I got the rad photo! 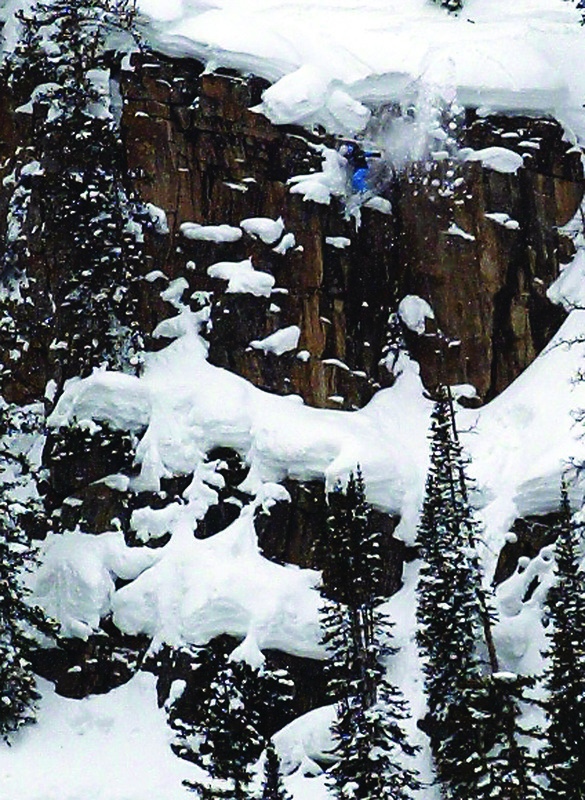 I have to admit that this line is undoubtedly the gnarliest, hardest line I have ever skied. Despite the hot tub, I am proud to have skied it, and cannot wait to use it as a stepping stone for my next most difficult line. The CFC is the last of my competitions for the season. Despite not making a podium, failing to acquire a ski sponsor, and crashing in 3 of the 4 competition runs I had this season, I had the most fun I have ever had skiing (which is saying quite a bit), and fully intend to follow the entire Freeskiing World Tour next year. I just got a new GoPro, and the snow is starting to stabilize across the west, so get ready for some fun edits and ski mountaineering coverage in the coming months!